Like many true individuals, this issue’s “Sweet of the Week” pretty much goes by one name. “We nominate Rutu,” says Jennifer Pryor at White House Florist, last week’s Sweet. 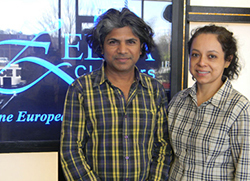 Rutu is Rutu Bhonsle, the India-born entrepreneur who owns and operates Zebra Cleaners with his El Salvadoran wife, Nicole. Besides European-style dry cleaning, Zebra provides alterations, as well as wedding gown preservation and cleaning. “You won’t find a more cheerful, outgoing fella in Lexington,” Jennifer promises. She and her family have been taking their dry cleaning to Zebra since 1998, when the Bhonsles opened for business near the U.S. Post Office on Augusta Highway. In 2001, Rutu and Nicole opened a second Zebra Cleaners near Lexington High School; in 2010, they opened their third in Irmo (Peak Exit). By this summer, they’ll be working in their new downtown Lexington location, next to Pine Press Printing, in the former Miriam’s Petites & Missy Fashions building. Zebra Cleaners (www.zebracleaners.com) just started offering free delivery service. Nicole and Rutu moved to Lexington from New York in 1993, following a visit here by train. After living in the big cities of Mumbai, New York and Leicester, near London, Rutu was captivated by the South Carolina countryside. They had friends in the area, as well as a fellowship of Rutu’s church, the International Family Church. “We said, ‘Wow, this is something fantastic,’” Rutu remembers. When their plans to open a bistro didn’t come together, the Bhonsles decided to enter the dry cleaning business. Nicole worked for a friend’s dry cleaning service, and Rutu went to Europe to study dry cleaning methods there.